It has been awhile since I've updated about my Mia, she turned 1 yr on November 10, 2010, she was 12 weeks old when we got her on February 7, 2010, Superbowl Sunday. 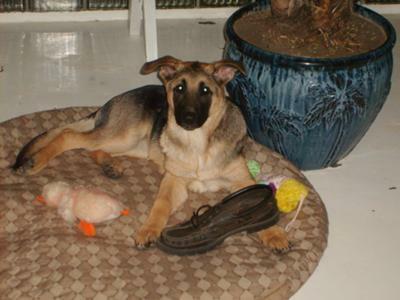 Some of you might not have read our heartwarming little story, but if like you can go to GSD Puppy Mia's story. She is now 20 months old. She is so loving and protective! Anyone walking around outside, she will let them know, don't come in here with her strong bark, she is our little protector, but she is also gentle, especially with children. She loves to run after the ball, any kind of ball, tennis, softball and especially a soccer ball or even a stick, actually she is a good retriever. She can't leave the bunny rabbits alone, it's her yard and she chases them out. She is such a good girl and very proud of her too! Mia is momma's baby but she is a daddy's girl! 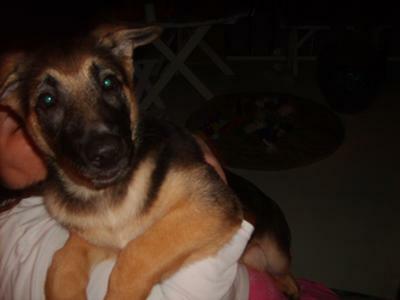 It is so nice to hear from you and thanks so much for the nice update on your German Shepherd puppy Mia. She is just beautiful. And there are some great pictures of her here too - thanks so much for sharing those with us all here. 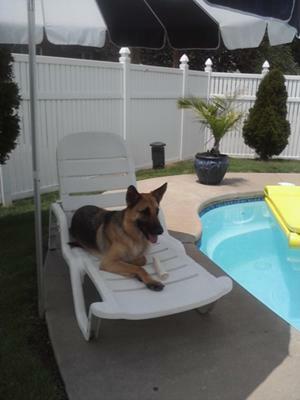 I don't know about everybody else for sure, but I think they would agree with me when I say that I certainly enjoy seeing everyone's pictures of their German Shepherd Dogs and puppies here. And it's nice to read the stories too because we can see not only how different but also how alike all our German Shepherds are. By the way, to all our readers out there, please tell us also precisely what you think about Linda and Mia's above tale by leaving some her some intriguing comments below. I am sure they would love to hear what you have to say too. 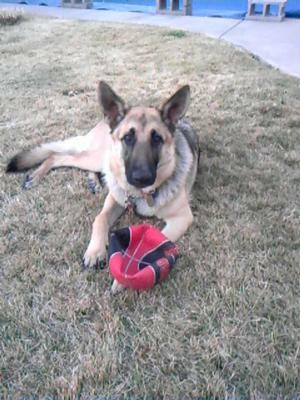 Thanks for commenting on Maxx's GSD page. He is such a character and we are completely in love!! You suggested I read about Mia and I truly loved her story! What a wonderful outcome for her and also for you. My husband, Wayne, and I do not have any kids and our dogs are our salvation. They are the best companions and we could not imagine our lives without them. You were right, Mia and Maxx could pass for brother and sister. She is beautiful and I, personally, am grateful to you for giving her a loving home. So many animals do not get a break like that. It is a great story with such a happy ending. Congrats on her 1 year birthday. I will try to remember to post Maxx's birthday photo when it comes around.